The draft for the 2018 World TeamTennis season was held in Indian Wells, Calif. on Tuesday, and the New York Empire unveiled their roster for the upcoming season. 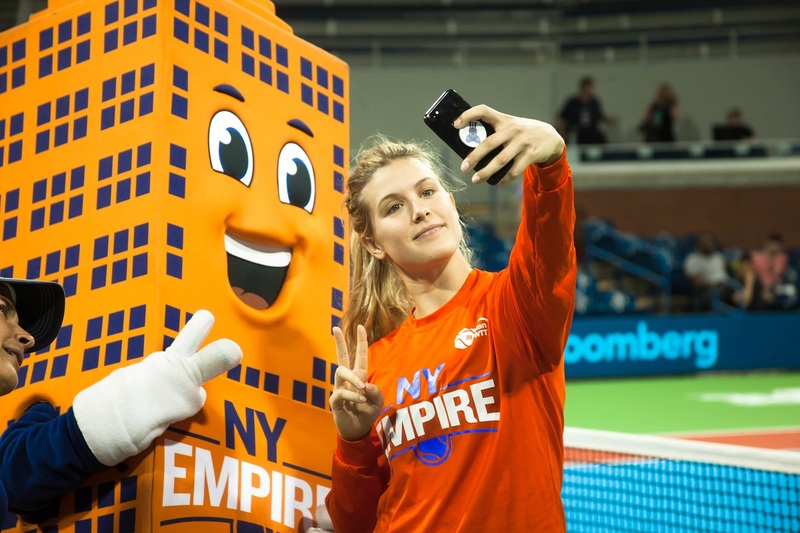 Returning for the Empire will be Americans John Isner and Mardy Fish, as well as Canadian Eugenie Bouchard and Great Britain’s Neal Skupski, who helped lead the Empire to a 7-7 record and third place finish last year at the USTA Billie Jean King National Tennis Center. With its first selection in Tuesday’s draft, the Empire selected Tatjana Maria of Germany, who will be making her World TeamTennis debut this season. In the second round, the Empire chose American Dennis Novikov, who will be competing in World TeamTennis for the second time in his career. In the final round, the Empire completed its roster by taking Spaniard Maria Jose Martinez Sanchez. Bouchard, 24, returns for her second season of New York Empire tennis at the USTA Billie Jean King National Tennis Center. The Montreal, Quebec native made her Empire debut last July, defeating the Orange County Breakers’ Yanina Wickmayer in women’s singles action. Bouchard is an accomplished professional on the WTA tour, reaching the Wimbledon final, Australian Open semifinals and French Open semifinals in 2014. Fish, 36, returns for his eighth WTT season after helping lead the franchise to within one spot of a WTT Finals appearance in 2017. The Los Angeles resident, who won six ATP World Tour singles titles during his career, will appear in home matches on July 23, July 25 and July 26. The 6-foot-10 ace specialist, Isner, will play his eighth consecutive season of WTT and will appear in the season-opening match against the Washington Kastles on July 15. The former University of Georgia All-American is currently the No. 18 ranked player in the world and is fourth all-time in aces served in the ATP. Skupski, who returns for his third consecutive season with the New York Empire, will serve as the team’s doubles specialist in the 2018 season. In 2017, Skupski played 122 games of men’s doubles and 97 games of mixed doubles, serving up 25 aces along the way. Maria, selected with the Empire’s first pick in the draft, is a 30-year-old German currently ranked No. 56 in the world in singles on the WTA Tour. Maria has won two doubles titles on the WTA Tour and has played for Germany’s Fed Cup team. She has advanced to at least the second round in each of the four Grand Slam events, with her best result a third-round appearance at Wimbledon in 2015. Novikov, a former UCLA All-American who spent the 2016 WTT season with the Orange County Breakers. Novikov, 24, was born in Moscow, Russia, and grew up in San Jose, Calif. In January, Novikov upset former world No. 5 Kei Nishikori at the $125,000 ATP Oracle Challenger in Newport Beach, Calif., and last month, he won his 11th ITF professional singles title by winning the Morelos Challenger in Mexico. Sanchez is a 35-year-old WTA Tour veteran has won 18 tour doubles titles and five in singles. She achieved a career-high doubles ranking of No. 4 in the world in 2010. The New York Empire will kick off the 2018 schedule with a home-and-away series with the Washington Kastles on July 15 and July 16. Further highlights of the 2018 schedule include a visit from the defending King Trophy winners Orange County Breakers on Thursday, July 26 and two home matches against the Philadelphia Freedoms.